Chop the tomatoes. Crush the garlic and add to the tomatoes. Add oil. Mince the basil and add to tomato mixture (reserving a few leaves for garnish). Add salt and pepper to taste. Mix well and let stand at least 15 minutes. 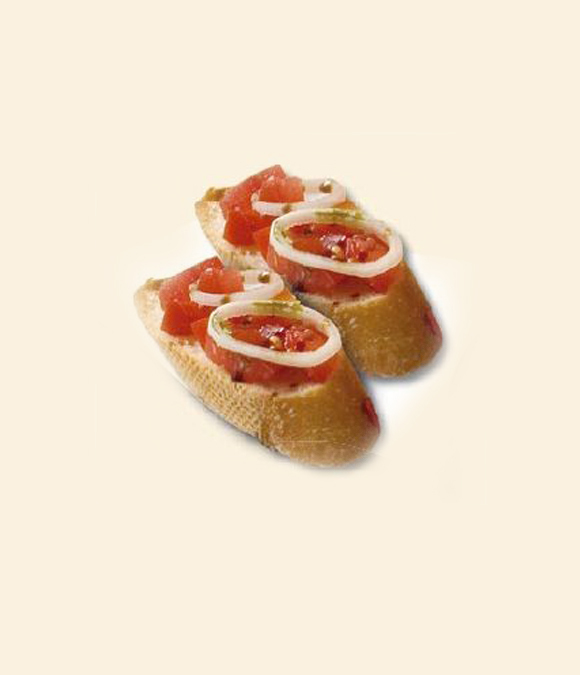 Toast both sides of the Ciabatta slices. Arrange the still warm slices on a large plate, dribble with pumpkin seed oil, spread the tomato mixture on the slices and garnish with the reserved basil leaves. Ready! This is very quickly prepared and is easy on the stomach. I often make the bruschetta after work. A nutritional complement: arrange on the plate beforehand washed and dried salad greens. Especially good is rocket salad. Preparation: Finely slice the beef and arrange on a platter. Sprinkle with salt, pepper, and chopped onions. Drizzle over Styrian Gold pumpkin Seed Oil and vinegar. You may also substitute a good sausage for the beef.